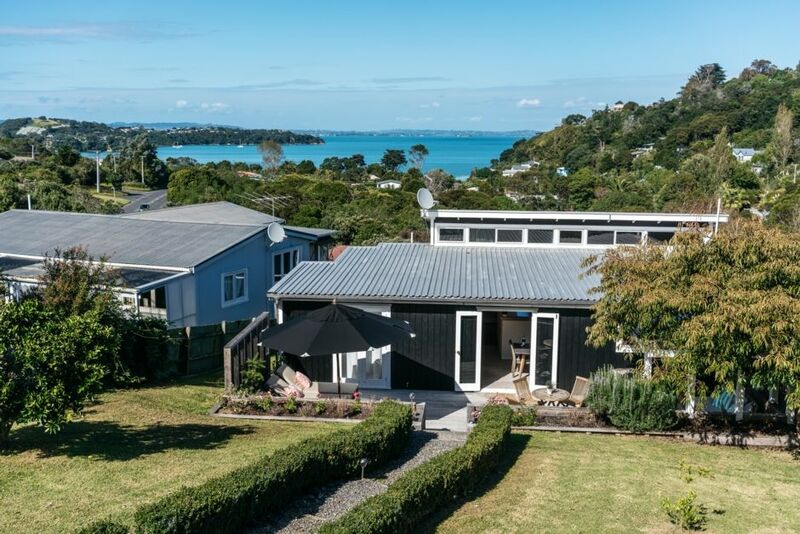 Minutes from the buzz of Oneroa village and with great views out over the Hauraki Gulf, Tipaka Moana Cottage is a lovingly renovated, character house ideally situated for you to enjoy the delights of island living. The cottage has an open plan kitchen, dining and living room, with a heat pump to keep you warm in winter and cool in summer. This opens onto a sunny courtyard at the back and a deck at the front with views over the Hauraki Gulf. The most difficult decision of the day will be which area to settle into with a book to relax! The 3 double bedrooms open off the living area. The master bedroom has lovely views out to sea, and an ensuite. The second bedroom opens onto the sunny courtyard. There is a further family bathroom and laundry. Located a minutes drive from Oneroa Village and Beach, or 15 minutes walk, this is the perfect spot from which to explore the island! With a bus stop along the road, you don't even need to hire a car - you are a 10 minute bus ride from Matiatia Ferry terminal and the many wineries that Waiheke offers! Freshly laundered bed linen and towels are provided and there is a well equipped laundry available for use in the cottage. Each stay incurs a $150 charge for quality linen, towels and exit clean so you have nothing to do but relax, refresh and enjoy. A fabulous cottage with views over the Hauraki Gulf, minutes from Oneroa Village, and with great views out over the Hauraki Gulf. Tikapa Moana Cottage is a lovingly renovated, character house ideally situated for you to enjoy the delights of island living. Great spot with amazing views and comfy seating areas inside and out. Bedrooms were great, kitchen had all you need. I would book again! This property is in a quiet residential area, a minutes drive, or 15 minutes walk, to Oneroa Village. It is a few minutes drive to both the Matiatia passenger ferry, and the Kennedy Point car ferry. Within 10 minutes drive are lots of wineries and fabulous beaches! There are lots of lovely walks on the island, both coastal & through native bush, and a zipwire for those wanting a thrill!